Sorry I've been neglecting this blog this last week or so! The rest of spring break flew by, and this last week has been spent working a lot in my studio, grading, reading painfully complicated art history articles, and 'catching up' in general. In the beginning of the semester I had been in a bit of a rut art-wise, but recently, things have been going well. I've been working on part of my Sweater Project. 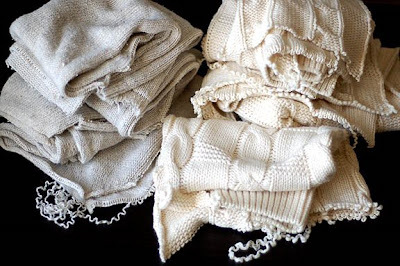 This week I've been spending a lot of time spinning together recycled sweaters. Here are two of the sweaters that I've deconstructed into pieces. I wanted a bulky yarn for this project, so I am combining both sweaters into one yarn, I am taking two strands from the sweater on the left, and one from the sweater on the right. 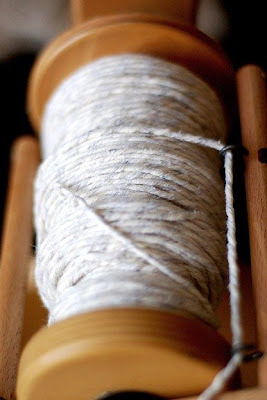 When I'm done spinning the three strands together, I'm going to ply in back on itself to make it really chunky. So far I've spun three spindles today. I'm going to start plying them today. I love the subtle difference between the two colored sweaters in the yarn. Hope you all are having a good Sunday! I'm heading in to the studio for a while today, and hopefully I'll get enough done that I can go to knit night tonight. oh wow, I'm intrigued!! 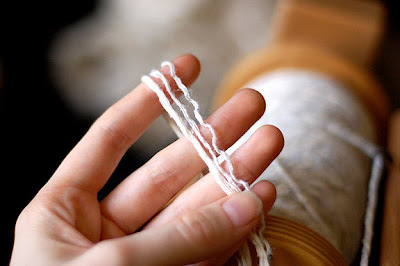 Can't wait to see what you knit up with the very chunky yarn. The subtlety in the colour is gorgeous.